The ‘We Love Jungle Awards’ returns for a second year with a jungle line-up of epic proportions. Artists from across the globe will descend on The Mint Warehouse In Leeds on Sat 4th February to create an 11 hour indoor jungle festival of a scale that has never been seen before. 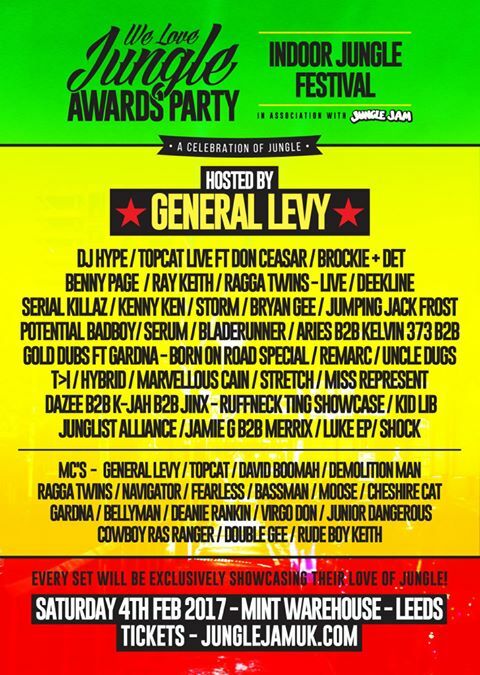 Appearing at the event will be General Levy, DJ Hype, Top Cat, DJ Brockie, Benny Page, Ray Keith, The Ragga Twins, Kenny Ken, Bryan Gee, Aries, Potential Bad Boy, Demolition Man, Navigator, Cheshire Cat, Storm, Bladerunner, Serum, Remarc, Marvellous Cain, DJ Stretch, Fearless, Jumping Jack Frost, Uncle Dugs and many more with a 50+ strong line-up of jungle veterans and newcomers. Limited tickets are still available from £25 including booking fee. The performers, nominees and industry guests will be joined by over a 1,000 dedicated jungle supporters to create a truly unique event. Spread across 3 rooms, the event will also include stage dancers, roaming performers and mouth-watering Caribbean street food. This is not a conventional ‘sit-down’ style awards event. Presentations will be made throughout the night, interspersed with DJ and MC sets from the scene’s top artists. ‘We Love Jungle’ is much more than an annual awards event. Through the website and social media platforms, WLJ is a permanent celebration of jungle music, curating and creating exclusive content for an ever-growing online community. Whilst the passion for jungle music has never diminished in many pockets, the last few years have seen a massive resurgence with a new generation discovering and reinterpreting the sound of the 90s. A global music scene now sees 20+ year old tracks rubbing shoulders with contemporary productions and new artists joining the ‘Old Guard’ of DJs and producers. Proof of this shift come in the form of comments made by top Drum and Bass artist Andy C who announced a return to the underground at his new XOYO residency and British institutions such Goldie, Grooverider and Shy FX all playing exclusive jungle sets at events around the world. The renewed interest and enthusiasm for jungle music mirrors the new interest in UK garage and the grime revival that has propelled artists like Big Narstie, Skepta and Wiley into the charts. With the success of Leeds very own ‘Jungle Jam’ flying the flag loud and proud, Jungle Jam in conjunction with We Love Jungle have also been asked to positively represent the scene with Stage takeovers at large scale events such as Hospitality In the Dock (London), Hospitality Bristol, Outlook Festival (Croatia) among many others.